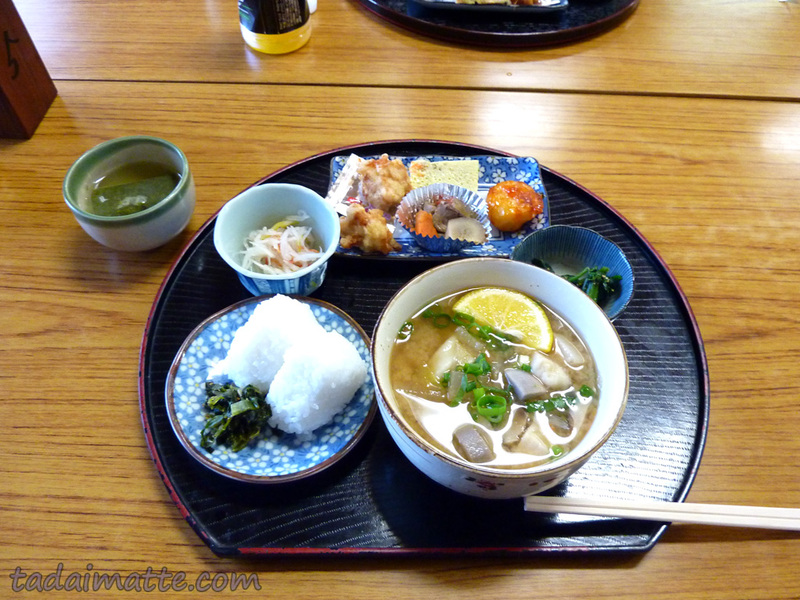 I tried several times to make Dangojiru, the tasty soup from Kyushu, on my own. (It's not exactly easy to find outside of Kyushu!) I based my recipes from a combination of recipes I found online, and what I ate myself in Beppu. Resources used were from Tess' Japanese Kitchen, OitaNet and The Asian Grandmothers Cookbook, all of which had solid-looking recipes, but none were QUITE like the fabulous meal I had at Ichinoide Kaikan. I prefer a very simple soup, similar to the one pictured above, so give it a try! Put all into a medium sized pot and let them soak for at least 2 hours (or refrigerate up to a day). Put the flour and salt large bowl. Make a well in the center and add several tablespoons of the water. Stir with a fork or chopsticks. When the water is mostly gone, add a little more water and stir more. Repeat until the flour looks like coarse sand or even like gravel. Press the mixture into a ball. Knead on a floured surface for about 5 minutes, until the dough is the consistency you feel when you pinch your earlobe. ;) Cover it with a damp napkin and let it rest for at least 30 minutes. Flatten the ball of dough and cut it into strips, about 3/4 inch wide. Gently stretch each piece and lay it down, then go back to the first piece and stretch again; this time each noodle will be a little longer. When you place a newly stretched noodle down, you’ll notice it will shrink a bit. After about 2 rounds of stretching and the noodles are shrinking a lot (they should be about a millimetre thick), cover the noodles with a damp napkin and let them rest for 10 to 15 minutes. Put them on a dry towel on a rack, cover them with a dry towel, and proceeded with the rest of the cooking. Over medium heat, bring the dashi almost to a boil and cook for 5 minutes, maintaining a bare simmer. (Don't boil, or it will become cloudy.) Let it stand off the heat for 5 minutes, then remove the kombu & mushrooms, and strain through a cloth. Add vegetables to the soup and cook for a minute or two on medium. Then drop the noodles into the soup, one by one, and cook to desired consistency. 3-5 minutes is a good place to start checking on them. You can use whatever veggies you like - various recipes recommended sweet potatoes, bok choy, cabbage, tofu, aburage, potatoes, onion, spinach, green beans, taro, choy sum, etc. Serve! The noodles do not keep well for leftovers, so if you think you have made too much, freeze the extra dough without cooking it. You can always add more noodles to your soup (4 noodles per person seems like a wise amount! ), but it's much harder to remove them once it's done and you want to store away the leftovers. For extra caution, you can cook the noodles in a separate pot with some standard dashi powder and serve that way. Credit for the original recipes I used to narrow this one down are via Tess' Japanese Kitchen, OitaNet and The Asian Grandmothers Cookbook.